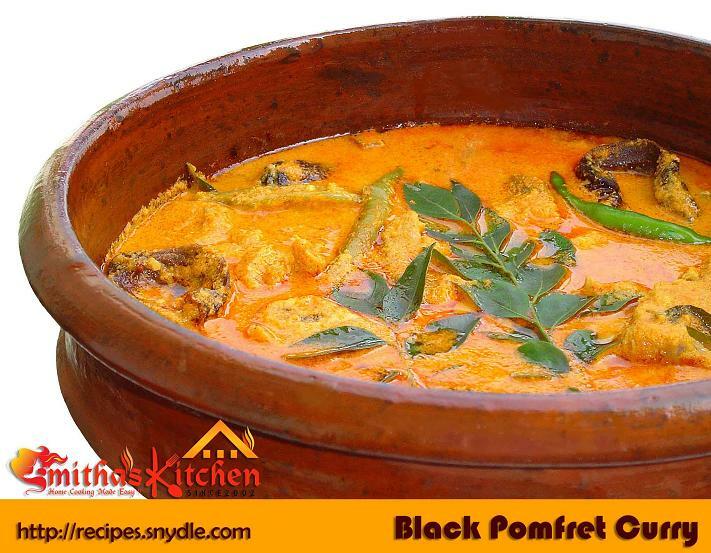 BLACK POMFRET CURRY ആവോലി കറി is an authentic Kerala style mildly spiced fish curry using fresh Black Pomfret cooked in a ground coconut based gravy. This is a good accompaniment with boiled rice. Clean and drain the fish, cut them into medium sizes and keep aside. Grind together the grated Coconut, Red Chilli powder, Coriander powder, Turmeric powder, and Fenugreek powder with little water to make a smooth paste. Heat 1 tbsp Coconut Oil in a pan (preferably in a Clay Pot), add Fenugreek seeds followed by the Shallots, Ginger, Garlic, Curry Leaves and sauté till the oil separates. Add ground Coconut masala paste, Gambooge (kudampuli) and 1 cup of water and let to boil. Add enough water to immerse the fish pieces and cook on low heat. When the Fish pieces are almost cooked, increase the heat and continue cooking till the gravy thickens and the oil gets separate at the side of the pan.